The Victorian era saw a significant change in the public attitude towards children in Britain. This can be seen in various factory and employment acts, which reduced the number of hours that children could work. It can also be seen in the number of benevolent societies for children and orphanages set up during the period. In art it can be seen in the sentimental paintings of childhood popular throughout the era, and in the occasional mawkishness of Charles Dickens. 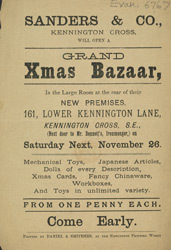 The Victorian middle classes also became increasingly defined by their disposable income and many could now afford to buy toys for their children. Boys tended play with tin soldiers, kites and model trains while girls had hoops, dolls and prams.